Description This makes a nice, light main dish salad. Accompany with potatoes dauphinoise for a hearty menu. 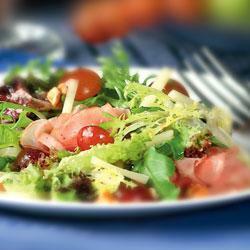 In large bowl toss together frisee, mesclun, ham, cheese, grapes and pecans. In small bowl whisk together oil, vinegar, sugar, salt and pepper. Pour dressing over salad, toss well to coat. Serve immediately.